Enjoy a luxury break in Portugal, elected European Leading Destination in 2017 and 2018, and taste some of the most unique wines and the greatest dinning experience. 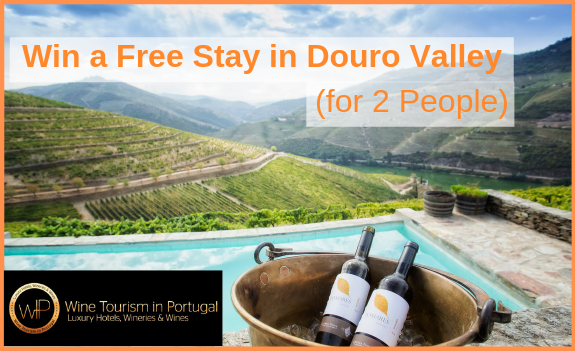 One-night stay in a high-quality hotel in Douro Valley, right in the midle of gorgeous natural landscapes. Wine tasting experiences at the hotel's winery. Dinner in a renowned restaurant with a pre-set menu and wine winepairing. Indulge yourself with the traditional delicacies. Share the contest publicly on your Facebook profile (so that we can confirm you shared it). You can participate once per day from 14 December until 31 January to increase your chances to win. Comment on our Facebook contest mentioning 3 friends that would enjoy this experience too - HERE. This contest starts on 14th December 2018 at 15h00 a.m. and ends at 31st January 2019 at 23h59 p.m.
Only one entry per person permitted and all of the actions mentioned are mandatory. The winner will be chosen randomly by an automated system. The name of the winner will be published and he or she will be notified by email by 1st Febuary 2019 and the prize can be redeemed by replying to that email in 24 hours. If the winner doesn't intend to enjoy his or her prize, a second winner will be selected. The prize must be enjoyed until 30th April 2019 and is subject to availability of the hotel. The stay doesn't include weekends, holidays or special dates. The prize does not include transportation to and from departure point and other experiences in Portugal but Wine Tourism in Portugal can help you book it. By accepting the prize, the winner agrees to reasonably promote the experience and Wine Tourism in Portugal in his/her social media. By accepting the prize the winner agrees to share the most relevant pictures and vídeos of the hotel and the experience as well as relevant comments, testimonials and reviews for Wine Tourism in Portugal promotion in its blog and social media.